It is a statute almost unimaginable in its time and place. Passed by a territorial legislature far from the urban centers of the nation where it might have been expected. And it is noteworthy in so many ways. The statute? One The Legal Genealogist finally located last night, poking around in early laws while preparing for this weekend’s 2017 Genealogy for You Seminar at the Saline County Library in Benton, Arkansas. I’ve been looking for it, on and off, for a while, after reading about it some time ago in a law review article. And last night I found it. Now… don’t get too excited. 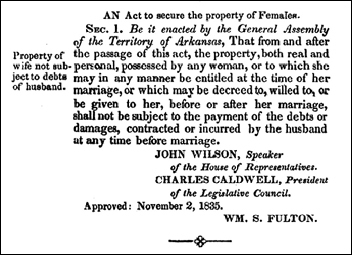 Despite its groundbreaking nature, this Arkansas statute had pretty limited impact overall. For women’s rights, here in the United States, it was a place to start.